Waist trainers are used to reduce the circumference of someone’s waist through the use of a steel boned corset. Waist trainers have become insanely popular in the past year. Many celebrities endorse and promote the use of waist trainers. You can often see celebrities like the Kardashians raving about them. Whenever a Kardashian seems to promote something it catches like wildfire. Many women want to instantly have a slimmer figure, striving for that hourglass look. Many people think that by wearing them it will reduce fat cells. Dr. Andrew Miller, a plastic surgeon of Associates of plastic surgery flat out disagreed with this statement. I find myself asking the question why would any logical thinking person use these things? These things seem so dangerous to your health. With the use of waist trainers all your organs are crammed together and space in your abdomen is reduced. That sounds pretty scary to me. Many women wear waist trainers for ten hours a day. 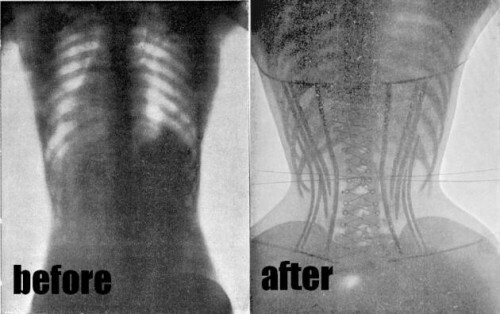 The damage done by waist trainers are often permanent. Waist trainers also make it hard for you to breathe and can induce acid reflux. The Usatoday points that many people pass out because they can not get enough air when wearing them. The picture below shows the before and after of using a waist trainer. It clearly shows how the ribs at the bottom are more narrow and compresses all the organs in that area. A study was attempted where participants tried wearing a waist trainer for 12 to 16 hours a day for a month. Many people dropped out of this study because they found the trainers to be too uncomfortable. A women reported the feeling of wanting to throw up after eating food while wearing the waist trainer. Dr. Oz also looked in on this trend and took MRIs of a women who has used waist trainers. He first took an MRI where the women was not wearing a waist trainer. Everything seemed perfectly normal. Then a MRI was taken where the women was wearing a corset. The MRI shows that the waist had shrunk about 2 inches. Organs like the kidney and gallbladder were squeezed upwards and the rib cage was being pushed up against the liver. The outcomes of using a waist trainer are not worth it. Many people think that it will help you lose weight but there is no proven evidence. There are many other ways to become slimmer without distorting your whole body figure. Waist Trainers are not healthy especially wearing them for long periods of time. This entry was posted in Uncategorized on September 16, 2016 by Melissa Lee. Especially after viewing the before and after pictures posted, it is scary to think about the serious damage so many women are potentially facing. Women are often misguided to think in terms of beauty instead of health and sometimes just common logic. For people to think that wearing a waist trainer reduce the growth of fat cells is completely illogical and alarming that it has been considered by such a large scale of people now. I have seen waist trainers before but always felt that they must be unsafe. This is an article that discusses many dangers of waist training. My best friend has been using a waist trainer for 2 months now. She works out in it so she can lose the water weight in her torso but immediately gains it back as soon as she loads up on the liquids. “Seeing the results” has made it impossible for her to stop using it. It is not a permanent fix but it will do permanent damage. Your ribs will bend and your organs will eventually start crowding together. Beauty is definitely NOT pain. In this article , studies suggest the in some extreme cases, waist trainers can be detrimental to a woman’s mental health as well. Don’t do this to yourself, ladies. This is awful! Your blogging is great… but the topic is so sad. It is so upsetting that women are so desperate to fit in that they feel the need to engage in a fad such as this. Not only is it not healthy, but it is not necessary. We are all beautiful in different ways. This reminded me of something totally random but a thing known as derma rolling. This is another fad that is apparently used by the Kardashians. It’s painful but I know someone who does it to try and improve their image. Here is video explaining it a bit. I would post an article but this gets the point across better I think. I, too, do not understand the logic behind using these waist trainers. Yes, they can produce a slimmer figure but at what cost? When it comes down to it, is the shape of your waist really worth damaging your health over?? This post inspired me to research more on the harmful effects. You should take a look at http://www.womenshealthmag.com/weight-loss/waist-training. Speaking in regards to the male perspective, I think that women should not partake in this. Not only is it unhealthy but it is unnatural. Humans are made to be natural and beautiful not modified. I think women should be happy with what they are given and not was is perceived as good. My sister tried to follow this trend as well after seeing the media emphasize all the “benefits” that come out of waist training. She also quickly dropped the trend because of discomfort and realizing a body isn’t supposed to be pinched like that. Here she expresses the importance of having a healthy core, especially for women and ones that want to have children. I think they’re scary! I agree completely, they are a terrible trend. I don’t understand why women are constantly trying to change their bodies in this day and age. Everyone seems to be looking for an easy way out to get their “perfect body” but truly, the only way to do it is the old fashion way-eating healthy and exercise.